Galeries Georges Petit, Paris (acquired from the artist, November 1904). Acquired from the above by the family of the present owner, August 1922. P. Redd, "American Dealers Looking to Europe for Art to Exhibit," The Pittsburgh Sunday Post, 22 June 1924. Y. Farinaux-Le Sidaner, Le Sidaner, L'oeuvre peint et gravé, Paris, 1989, p. 96, no. 180 (titled La Rivière, Automne; with incorrect annotation). 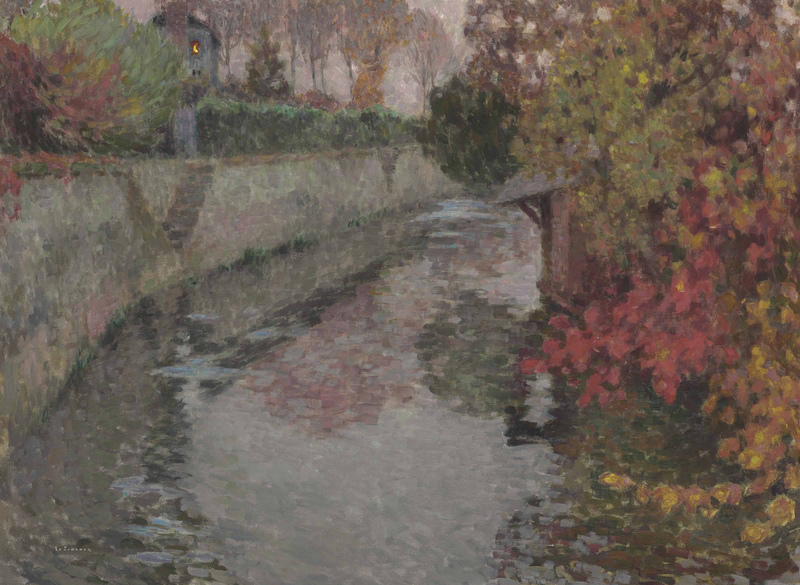 Yann Farinaux-Le Sidaner will include this work in the forthcoming supplement to his Le Sidaner catalogue raisonné. The present work, once thought lost, is an exceptional rediscovery. In the artist's catalogue raisonné, published in 1989, the painting is referenced without an illustration and is listed as having been destroyed by the artist. In fact, Le Lavoir, Gisors was acquired by Le Sidaner's then-dealer Georges Petit the month it was executed. Petit subsequently sold it to an American collector in August 1922, passing to the present owner by descent. Not long after arriving in America, Le Lavoir, Gisors featured in an article in the Pittsburgh Sunday Post, its author praising the "rich autumnal colors" (P. Redd, op. cit.). (fig. 1) Henri Le Sidaner, Les Amoureux, Gisors, 1912. Sold, Christie's, London, 7 February 2006, lot 273.